Quinlan & Cooke Boutique Townhouse, formerly QC’s, situated in the heart of Cahersiveen on the spectacular Wild Atlantic Way is a hidden gem. Originally known as a destination restaurant when visiting Kerry, QC’s has been transformed by owners Andrew and Kate Cooke into the ideal destination for visitors, with the addition of rooms and residential facilities, offering a touch of luxury combined with a homely charm. 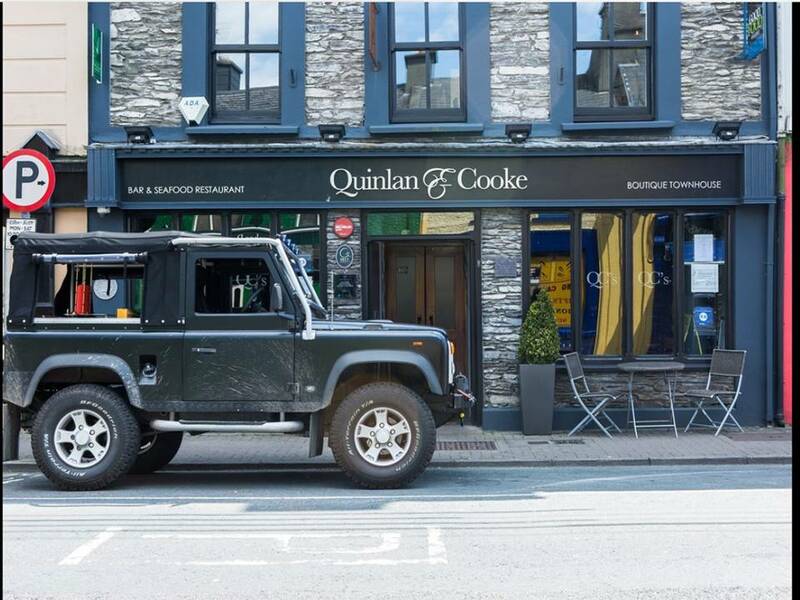 Quinlan & Cooke offers the ideal base for guests looking to explore the Skellig’s, Cahersiveen and Kerry, all of which are steeped in history, culture and rugged beauty. Experiences of all kinds can be found ranging from the world class golf courses in Waterville, walking and hiking the Kerry Way, genealogy research, cycling and fishing. This family run townhouse offers 10 beautiful ensuite guestrooms and a luxurious suite, all individually decorated in a unique and quirky style. Andrew and Kate have built both the business and reputation of Quinlan & Cooke by working extremely hard to give their guests the most memorable and enjoyable experiences by ensuring each guest receives a warm and friendly welcome and leaves with fond memories and stories that will last a lifetime. The restaurant at Quinlan & Cooke, QC’s, serves only sustainable fresh, wild Irish local fish, supplied by the family company, Quinlan’s Kerry Fish. Menu’s feature ultra-fresh seafood with a choice of daily specials. Mouth-watering offerings include seafood platters, local crab, sizzling Dingle Bay prawns, pan seared baby squid and the family’s world renowned smoked salmon. Other facilities available with Quinlan & Cooke include Clay Pigeon shooting, FSX Golf studio and a small well-equipped gymnasium.